Whenever I review a product I try to judge it fairly and yet critically. In my recent barbecue article, I talk about how useful it is to have a large cool bag to avoid constantly running back and forth to the kitchen and perhaps burning your food. When choosing a cool bag for this specific job size is a very important factor, so avoid anything less than 20 litres. This is a good size and well designed cool bag and a decent quality for the price. The bag arrived quite flat because there are two velcro straps that make it possible to pack it flat, which is useful for storage or even when packing into a suitcase. Additionally these straps can be put out of the way by using the other two velcro fasteners located inside the lid, so they are not just dangling around ready to catch themselves (as velcro fasteners have a want to do). It can either be carried using the adjustable shoulder strap or the two handles can be fastened together. This particular model has an extra access point on the top so you can get things out without unzipping the whole lid. There is also a useful large exterior pocket for things that don't need keeping cool. It's the little touches that show the thought that went into the design. As I said the overall quality versus price is good though it was a little stiff when I first tried to zip up this bag. Given that the zip is positioned at the very top of the cool bag and has to go around corners without catching the lining I would advise you gently work it back and forth a few times before you use it to loosen it. The thick thermal insulation is food safe and PVC free. The lining has heat sealed seams to contain spills and for easy cleaning. After impressing me overall, the included "free ice pack", was a bit of a letdown. I was hoping that Polar would have included a specially designed cool block that covered the base of the bag, even if this raised the price slightly. 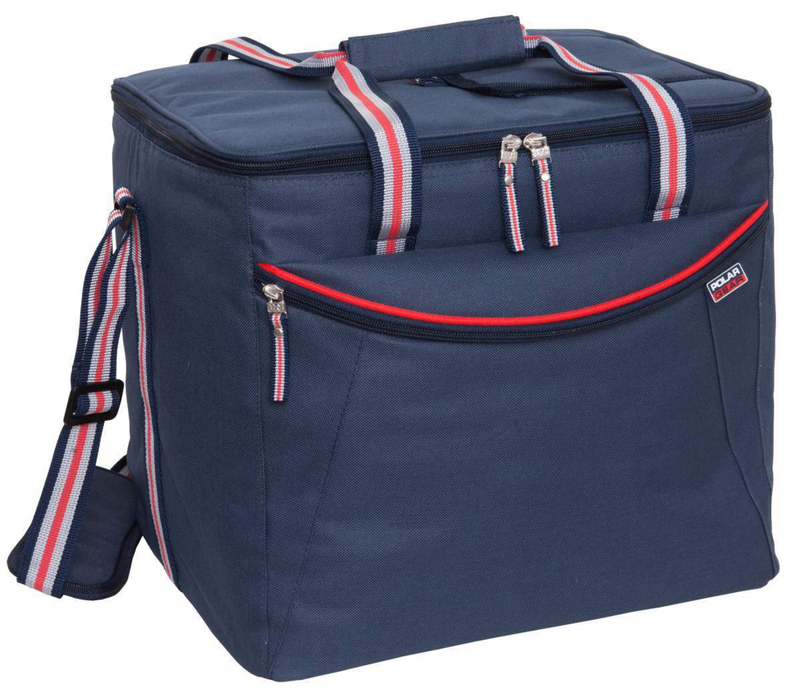 Polar is a well-respected name in commercial refrigeration and this is a well-designed family size cool bag, especially when you are planning your next Barbeque. Ahead of time figure out which assortment of your plastic containers fit your cool bag to make sure you maximise the capacity of the bag. You want a mixture of sizes but try to avoid round ones as they will waste space. Prepare your food the night before (and refrigerate). Whilst your barbecue coals are tempering, place each item of food in separate containers ie The chicken in one, vegetables in another, seafood in another and so on. Place frozen cool blocks at the bottom of the cool bag and then pack your food. Try to place the items you need first towards the top. Add any additional cool blocks if you have any room left in the cool bag. Try to keep the cool bag in the shade if possible, though a good cool bag used correctly should keep food cool for at least 6 hours. I also like to have a work table behind or next to the barbecue, which may also offer shade to the cool bag. Always reseal the cool bag as soon as possible to keep the cold in. You can also use a little portable digital thermometer in you have any concerns. Just place the probe end into a small bottle with water in. Remember you should always keep your foods 5c or lower to keep it safe. It is also good to have extra cool blocks on standby in your freezer, if you feel the blocks in the cool bag need switching. chefkevin1hotmailcom is using Hatena Blog. Would you like to try it too?